The Vanderbilt Psychiatric Hospital (VPH) has opened a Psychiatric Assessment Service (PAS), combining two existing services into one secure location — a win for patients being cared for at VPH and their families. The seven-bed PAS encompasses the Psychiatric Transition Unit (PTU), which has been housed in the Vanderbilt University Hospital Adult Emergency Department for the past six years, and an access and admissions department that has been located at VPH since the hospital opened in 1985. Both services are a vital part of Vanderbilt Behavioral Health (VBH), said Mary Pawlikowski, Vice President of Operations for VPH. During phase 1 of the PAS, individuals will continue to be evaluated in the Adult Emergency Department for medical clearance by an Emergency Department physician. Once it’s determined that the patient needs psychiatric care, two PAS staff members will travel the short distance from the Psychiatric Hospital by van or ambulance to pick up the patient from the ED and drive them back to the PAS, a locked facility, with its entrance located near Blakemore Avenue. The facility, currently staffed by attending physicians until midnight, is monitored for safety by a community service officer from the Vanderbilt University Police Department. Once the patient is taken to the PAS, an attending physician and resident will continue the psychiatric evaluation begun in the Emergency Department and determine whether the patient needs inpatient, outpatient care or partial hospitalization. “PAS has the opportunity to improve the openness and transparency of our assessment and admissions process,” said Nathaniel Clark, M.D., Chief Medical Officer for VPH. “We have an outstanding and collaborative medical team led by our new PAS Medical Director, Dr. Eric Rueth. “This service will optimize the efficiency of patient flow and enhance the teaching mission for our residents and students,” he said. Patients are monitored by the nursing staff, led by Jennifer Barut, MSN, R.N., the hospital’s Interim Chief Nursing Officer. “The interprofessional team, which includes physicians, nurses and social workers, together determines the appropriate level of care that the individual needs. This enhances the patient experience and improves access to behavioral health resources,” Barut said. 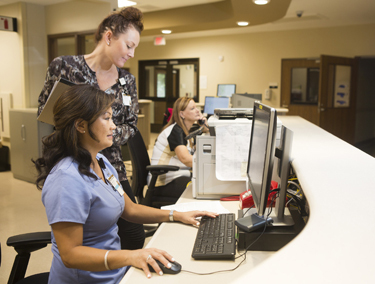 Once the patients are in the PAS, the staff work together to get the clinical picture, expedite where they need to go and can get authorization from insurance companies much more quickly. “It’s a healthier environment for our patients and their families,” Pawlikowski said. In phase 2, attending psychiatrists will staff the unit 24/7. “Also during phase 2, referring hospitals will be able to call the PAS directly and send patients for evaluation and admission, Pawlikowski said. The atmosphere in the PAS is quite different from a typical Emergency Department, she said. “Although our psychiatric patients are well cared for in the Emergency Department, sometimes the stimulation is too much. The ED is an active environment with bright lights and white coats and can be very frightening for someone who doesn’t have the ability to shut down those stimuli,” she said. Many of the safety and comfort features of the PAS are based on recommendations from members of the VBH Patient and Family Advisory Council. The unit has subdued lighting, and each patient room is spacious and comfortable so family members can stay. There are dimmer switches in each room so the lights can be dimmed to the patient’s liking. And since there’s a risk that some psychiatric patients can harm themselves or others, framed pictures on the walls are behind shatterproof glass and secured to the wall with tamper-proof screws. TVs are safely mounted and also behind shatterproof glass. “The PAS provides a therapeutic and safe environment for patients coming in acute psychiatric crises. It is our privilege to serve these individuals and their families in this setting,” Pawlikowski said.